Jake Stringer and his partner Abby Gilmore welcomed their first child on August 21, and have named their daughter Milla Jane Maree. Jake plays for the Western Bulldogs, and made his debut last year. He is the nephew of Jamie Bond, who played for Hawthorn and Fitzroy. 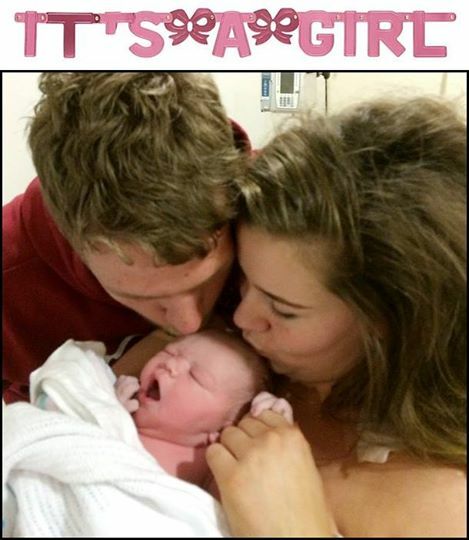 Daniel Merrett and his wife Sarah welcomed their daughter Matilda Jean on July 2. Daniel has played for the Brisbane Lions since 2005. Nathan Lovett-Murray, and his partner Janalli Brown, welcomed their daughter Harmony Mary May on June 1. Harmony joined big brothers Nyawi, aged 10, and Mara, aged 5. Nathan played 145 games for Essendon from 2004-13, and comes from a sporting family. He is the grandson of Sir Douglas Nicholls, who played for Fitzroy, and a cousin of former Essendon player, Andrew Lovett. Nathan’s sister Jessica is married to Carlton player Jeff Garlett. The blog featured the name Harmony for Harmony Day in March this year, and I wonder if Harmony Day also inspired the choice of baby Harmony’s name?